An all-expense paid trip to New York City, an opportunity to be mentored by extraordinary women -- global leaders and fashion executives, a chance to learn from other girls who have served their communities…sound interesting? It did to me too! I came upon this description for the HERlead Fellows' Leadership Forum while I was searching the internet for grants to help fund my third annual meal packaging event. I try to help tackle hunger in my community where one in five children and one in seven people face food insecurity. The past two years I have fundraised, organized, and recruited the help of 240 volunteers to supply over 37,000 meals to my local food bank. When I researched HERlead I learned that it is a women's empowerment forum designed to equip young women with the leadership skills they need to impact global progress, invest in their communities, and begin their journeys as the next generation of leaders. The program is sponsored by Vital Voices, and ANN INC., parent company of the women's fashion chains: Ann Taylor, The Loft, and Lou & Grey. 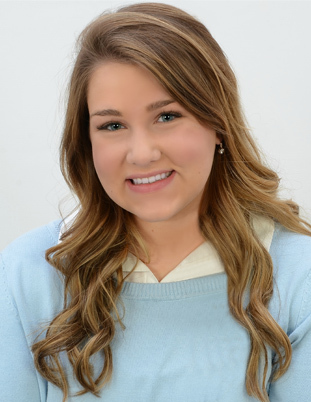 Daniella Lippert, Manager of Charitable Initiatives for ANNINC. says, "ANN INC. is committed to helping women put their best selves forward. . . We work hard to provide the best training and development to help these Fellows reach their goals." "Congratulations Clare! On behalf of ANN INC. and Vital Voices Global Partnership, we are thrilled to invite you to join the 2017 Class of HERlead Fellows. As a HERlead Fellow, you will join an extraordinary group of high school girls from across the country who are committed to creating positive change in their communities. Over the course of the Forum, you will undergo leadership training, meet with powerful women in New York, and learn from inspiring women leaders from around the world…"
I was surprised and ecstatic! Vital Voices staff contacted me quickly and arranged every logistical detail, including my flights. Despite much trepidation over picking out and packing "business-y" outfits for the four days, I was ready to take off on June 19th. My flight landed and I was off in a shuttle with two other girls to the Intercontinental Hotel in Times Square. My roommate, from Boston, became a close friend in an instant. Once all the girls arrived, we walked to Times Square Tower where the main offices of ANN INC. reside. This was home base for the days to come. 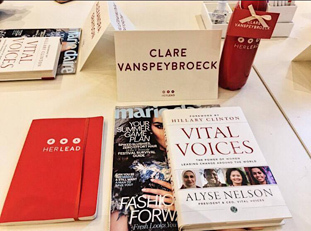 Our places at the conference tables were set with HERlead water bottles, pins, nametags, a book by one of the founders of Vital Voices, Alyse Nelson, and our own box of personalized business cards. After our opening session and dinner, we were off to shop at The LOFT where we received generous gift cards and a discount! Every detail was first class. I felt like a celebrity. The next day each girl was assigned a global leader and an ANN INC. executive to be our mentor and guide us through learning the Vital Voices Leadership Model. Each woman I interacted with impacted me profoundly. Just a few of the influential women who served as our global mentors included a Cameroon presidential candidate, a Brazilian artist who uses graffiti to bring issues of domestic violence to light, and a woman who tries to break the cycle of prostitution and trafficking in India. My mentor was from Guatemala and brings opportunity and income to women from indigenous communities by marketing their handcrafted goods. We also heard from the Editor-in-Chief of Marie Claire Magazine, the CEO of ANN INC., and a communication expert who works with major news network personalities. All of us fellows worked together, listened to successful women from all over the world and from many different walks of life, and left inspired to change the world for the better. Another opportunity for Fellows once they have completed the Leadership Forum is to apply for a HERlead grant to support service work. I am further developing my project to empower other youth by providing resources to assist them in planning projects of their own to tackle hunger. I feel empowered knowing that the HERlead network is always there for me to provide advice and support. Since I was so privileged to have had this opportunity, I am inspired to encourage other girls in their roles as leaders. My HERlead experience was life changing and I highly suggest applying! I asked Kristen McAvoy, Innovation and Strategic Investments Senior Program Coordinator of Vital Voices Global Partnership, to offer information and tips for future applicants. How many applications did you receive and how many girls were selected in 2017? "We received nearly 900 applications in 2017 and 30 HERlead Fellows were chosen." Do you have any advice for girls who would like to apply for the 2018 HERlead Fellowship? "My advice is to be authentic in your application. We really want to see that you are passionate about the issue that you are proposing, so do not choose an issue that you think the reviewers want to hear or deem important. It is essential for you to be invested in the idea that you are proposing, because if you are not excited about the issue it really comes through in your application. Also, if you choose to attach a video to your application I recommend dressing in business casual wear and having a plain background like a wall or a bookcase. You want the video to be professional and filming in your bedroom or outside where there a lot of people in the background is unprofessional and distracts from your message." What qualities or accomplishments are the reviewers looking for? "We look for many qualities when grading HERlead applications. We want to see that the applicant has either demonstrated outstanding leadership or has the potential to be an outstanding leader if given the opportunity to be a HERlead Fellow. Additionally, we look for applicants who have recognized a real challenge or issue that they want to address or have begun to address in their community, and who propose thoughtful and unique ways to learn more and/or tackle the issue. Applicants should also be diverse in their experiences/background as well as the approach to the problem they see. Lastly, we are looking for applicants who would benefit from and contribute to a network of young women leaders who positively impact their community, support other young women, grow their leadership capacity, and want to change the world!"